The following is an introduction to hill training (both uphill and downhill) and is not intended to be a complete discussion of the topic. About me: I am the race director of races on relatively flat courses (gently rolling at most). I am a certified endurance running coach. I am a runner who trains all summer in Sedona, AZ (only hills). I am a long distance hiker (last long trek was two weeks through the Alps with a backpack). I am a former professional alpine skier. As you can imagine from the last three statements, I spend a lot of time on hills, and not just occasionally training on them. In fact, in the summer I spend almost four months on hills without any flat ground training, even during long runs. I love it (not so much when I’m actually doing it, but I love the results)! Even if you live in a flat area like the Jersey Shore there are hills around if you look for them. For example, in Monmouth County, I have done lots of hill work in Holmdel Park and in Hartshorne Woods in particular. There are a number of good races (5Ks to half marathons) in NJ that have hills in them. Why train on hills when most of the races aren’t very hilly? Because they are great places to train to get stronger and faster and they provide more good training in a shorter amount of time than on the flat (not necessarily for long runs but for other types of training). If you want to get stronger and faster, hills are a good choice and in my opinion a good way to keep a training plan fresh. OK, so how should training on hills be done? Beginning runners and runners/walkers: Don’t do them yet. You need to build a base of miles run during which your body will make the necessary and normal adaptations required. This base building phase should last for at least 3-4 months. You can and should enter races during this time to get familiar with race day and to use them as a way to measure progress. These races should be at an easy pace (you should be able to hold a conversation while running – take walk breaks if you need to). Intermediate runners and runners/walkers: Start slowly and build slowly. For example, as a starting point: after a 10-15 minute warm-up jog do 1 set of five, seven, ten and twelve second easy uphill runs (see the posture and effort level below) and walk back down to recover. If your still feeling strong after the twelve second run, rest a minute and do them all again. Finish with a 10-15 minute cool-down jog. The 3rd week: after a 10-15 minute warm-up jog do 2 sets of 10, 15, and 20 second easy uphill runs (see the posture and effort level below) and walk back down to recover. Finish with a 10-15 minute cool-down jog. The 4th week: repeat the 3rd week plan. The 5th week: repeat the 3rd week plan and add two 30 second easy uphill runs (see the posture and effort level below) and walk back down to recover. Finish with a 10-15 minute cool-down jog. The 6th week: after a 10-15 minute warm-up jog do 2 sets of 20, 25, and 30 second easy uphill runs (see the posture and effort level below) and walk back down to recover. Finish with a 10-15 minute cool-down jog. Here’s my best advise regarding posture: look up (not at your feet – keep your head up either level or slightly up), run tall, bend forward slightly at the ankles, take short quicker steps, keep your arm swing more compact. Practice pushing off from your toes to move upward (it feels a bit like bounding up the hill). Please note: This can tire your ankles and calves (don’t do it if you’ve been having calf or heal pain – in fact don’t do them at all if you’re having pain in your lower legs – unless you get the OK from your PT). Here’s the part which so many people don’t do: go up the hill at a speed which feels ABOUT the same effort level as you were feeling prior to the hill (YES, that means that you are going to slow down as you go up the hill). It will likely feel harder on your legs but it should NOT make your heart race and you should not get out of breath. Slow down a bit if that starts happening to you. Some of you may ask how will I ever get faster doing that? Good question! Running by perceived effort is a good way for many of you to train because as you get more fit you’ll automatically be running faster to maintain the same effort level!! BTW- that applies to training during your long runs also. Advanced runners and runners/walkers: If you haven’t already incorporated hill training into your training schedule, you should start relatively conservatively also (although at a higher level than an Intermediate would). Maintain your good posture and start with four to six 30 second uphill repeats (walk or jog back down to recover). Add 5-10 seconds to the uphill portion each week. You should not let yourself get completely out of breath at the end of your run up the hill. At the top of the run your breathing should be labored and your legs will likely feel heavy. If that didn’t happen to you then add speed to your next hill repeats until you get to that state and can maintain it for the entire workout. Let’s start with those uphill training thoughts so that this doesn’t get to be too much info all at once. Now, on to the fun part, the downhill! Sure, I just told you to slow down on the uphill part (feel like a similar effort to the flat), and now I’m planning to tell you to go fast on the downhill part. It’s free speed! 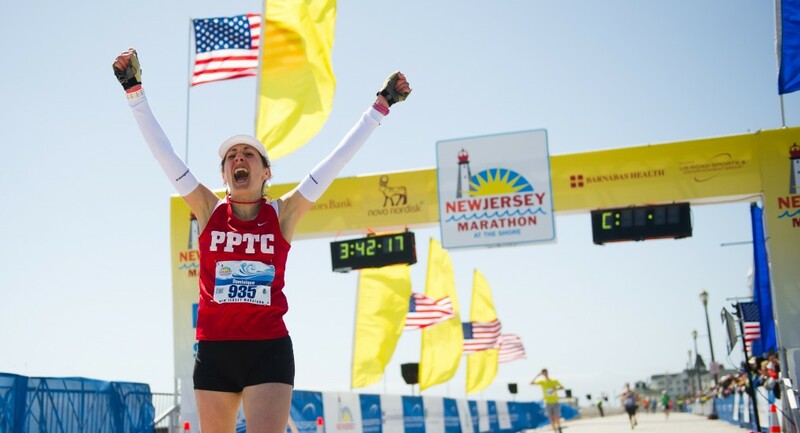 Why not take advantage of it wherever possible, even on small inclines like the ones on the Long Branch Half Marathon and New Jersey Marathon courses? They are they, just look for them. Please note: Downhill running can cause injury if done incorrectly or repeatedly. Don’t plan on doing repeated fast runs downhill. I suggest that you find the most relaxed way of running downhill without pain. “Relaxed” is the key word, and have some fun doing it at the same time. My fun is putting a bit of excitement into that part of the run/race, yours may be something else. Remember those short quick steps that I mentioned in going up the hill, use them again on the downhill sections. Now, as a skier I’m used to pushing my hips forward a bit in order to stand perpendicular to the hill as it tilts away from me, and so should you when running down the hill. If you’re not used to that feeling it can feel a bit strange, but what I’m really asking you to do is to stand in the same posture as you would when running on the flat. Really! It just feels like I’m asking you to risk falling on your face as it’s a new feeling perhaps but I’m really not asking you to run on your toes, just on the middle of your foot. BTW – You will not likely make up the time which you lost in the uphill section, but you will make up a good portion of it if you go as fast as you can down the hill. Remember, there is lots of good training effect from running downhill properly also. Different muscles will be used and they will be used more than normal. Less time, more results! What’s not to like? Pay attention to your posture as you practice running down the hill. Keep you feet under your hips (don’t lean back and push your fee out in front of you (over stride) in order to stay at a slow pace down the hill. If you try to apply the breaks with your quads, heels and knees you will trash your quads and knees on the downhill sections, especially if it is a long downhill or if there are a number of them! If I feel constant tightness in my quads on the downhill that’s when I know that my form is off and I need to push my hips forward a little more in order to get back into my normal stance (stop resisting the speed). One other important thing about the downhill training portion is that as you increase the number of steps you take each minute you will be training yourself to change cadence during your run. A faster cadence will increase your speed. I have to admit that I am sometimes a bit uncomfortable with the amount of speed during my downhill sections and especially during the first few weeks of my run and my bike cross training in Sedona, but that’s how I know that I’m doing it right. BTW – even when going fast down the hill, if I breath normally (don’t hold my breath), I can get in quite a bit of recovery during the decent (both running and biking). Speaking of training, if you cross train on a bike, make sure that you’re increasing your cadence to 90-100 rpm (stay out of the hard gears and get those feet moving quickly). Little things like this will help you get faster and change up your training a bit also. When doing hill training, don’t do hill repeats more than once a week. Try mixing up the hills you try –- some short and steep, and other longer ones with a smaller incline. Now, what questions do you have for me about this? BTW – If it occurs to you, it very likely is occurring to others as well, so ask. Here are some of the questions I often get from runners in general after their races (my students know the answers to these questions prior to their races). Q1) What should I be doing/not doing during the post race period to enhance my recovery! Q2) When can I start running again, how often should I run and how far? Q3) When can I start doing speed/hill workouts again? Q4) How soon can I run my next race? 1) how long have you been running? 2) how much of a mileage base do you have? 3) which race did you just run? 4) how hard did you run it – are you a completer or are you competitive with others or with yourself? 5) have you run other races recently? 6) how old are you? etc. BTW – “run” above also may apply to run/walk intervals as well, but the lingering effect of that technique is not usually as long lasting as a long run/race with 100% running. Half Marathoners (25 miles per week peak mileage, running for less then 1 year). I’d suggest to take off 1 day for each mile run – that’s about 2 weeks before starting any serious running. Get plenty of sleep, hydrate well at all times, eat a healthy diet with emphasis on quality protein, carbs and fiber and the good fats, AND cut down on the portions! You may feel tired and sore for the first few days (Delayed Onset Muscle Soreness – DOMS). Avoid sick people as much as possible during this period. You may also feel low/slightly depressed (that’s normal as your body has been trained to expect exercise regularly, and you don’t have a big, bad scary goal in front of you any longer!). If you don’t have DOMS, you feel good in a couple of days, please err on the side of caution. Once the soreness is gone, think about a fun run of a few miles, but don’t set a mileage or pace goal (20 minutes is a good place to start), and leave your distance and pace calculator at home or off! If this run doesn’t feel like fun, take a couple of more days off and try it again. When the joy of running has returned, add another fun run after a couple of days off. Repeat until every one of these runs are easy and fun and you’re neither sore nor tired afterward. This process should only take you a week or two. However, if the joy of running doesn’t come back then look for a reason and make a change. If you usually run alone, find a group or a buddy to run with, but only if you can run at your slow recovery pace with them (it’s not the time to show off by trying to run fast as they may not be in recovery mode). Choose a different route or run your favorite route backwards, etc. Pay attention to your mental state also. Full Marathoners (35-40 miles per week peak mileage, running for less than 2 years). I’d suggest to take off 1 day for each mile run – that’s about 4 weeks before starting any serious running. Get plenty of sleep, hydrate well at all times, eat a healthy diet with emphasis on quality protein, carbs and fiber and the good fats, AND cut down on the size of the portion! You will likely have Delayed Onset Muscle Soreness – DOMS for a few days. Some people enjoy light yoga and/or a message can help and both is even better (be careful of deep tissue work yet – the second week could be time to keep the blood flowing into the the damaged areas). You have a high likelihood of becoming ill as your immune system may be significantly weakened. Avoid group settings as much as possible and wash your hands often. The most important thing is to be aware of the increased possibility and try to avoid situations which will expose you to the greatest risk. Once you can walk normally and are not tired, likely after the following weekend (for a Saturday or Sunday race), think about a fun run of a few miles, but don’t set a mileage or pace goal and leave your distance and pace calculator at home or off (20 minutes is about right). If this doesn’t feel like fun, take a couple of more days off and try it again. When the joy of running has returned, add another fun run after a couple of days off. Repeat until every one of these runs are easy and fun and you’re neither sore nor tired afterward. This process should only take you a couple of weeks, but could take longer. If the joy of running doesn’t come back then look for a reason and make a change. I.e., if you usually run alone, find a group or a buddy to run with, but only if you can run at your slow recovery pace with them (it’s not the time to show off by trying to run fast as they may not be in recovery mode). Choose a different route or run your favorite route backwards, etc. Pay attention to your mental state also, as that could need attention also. Experienced athletes: Specific questions should be posted here and I’ll do my best to answer them. For more experienced people which I train, their recovery, after about a week for a marathoner, usually looks a lot like a reverse taper (the reverse of the last three weeks of their training plan). I hope that answers most of your questions, but if not please let me know. Remember, I don’t know anything about you and therefore can only give generic guidelines. My experience, my professional ethics and my professional insurance will not allow me to provide specific coaching advise as it is not possible for me to know the best answer for you without having spent time observing your training over an extended period of time. However I can provide the range of possibilities which I have seen work for many different athletes, if that is helpful to you in formulating your plan. So, how long before I can do speed/hill work again and when can I start training for my next race? I’m glad that you may be thinking about this already, as that’s a good sign. I would wait until the end of the 2 or 4 weeks to start anything like that. Can some people start up sooner, sure. I’d err on the side of caution as you want the repair process to complete before you start the stresses again. Done improperly, you will eventually break down, as this stress is cumulative, and with it you may get injured in a seemingly instantaneous manner, when in fact the injury is the result of the cumulative effect of over training for a number of weeks/months. If you plan to generally follow my advise then start your intervals, tempo runs, hill repeats gently and add to them slowly while listening to your body. I hope that’s not too much info at once. In summary, don’t worry about temporary muscle soreness as it will go away, expect to get back into running slowly, don’t be surprised if you feel a bit down, watch out for the effects of a temporarily impaired immune system, and sleep, hydrate, eat in proportion to your reduced activity level. You should be ready to get back into it within the guidelines. BTW – you have attained a relatively high state of physical conditioning, and a few well chosen weeks of rest and easy running will not put your back at the beginning in training for your next race. Weight Gain after your race, etc?